One can't help but wonder at the willfulness of the human race, shaping the universe one rock at a time. From dome to dome, from installation or mine to city, all the settlements on the moon must be connected by rail. There are no roads for cars, no atmosphere for airplanes. The only economical solution is rail. High speed, high capacity, reliable, and efficient. Are you up to the challenge? Can you drive the rail lines from Sirus Iridum to Mare Nectarus? Or from the Ice Mines at Scott to the Far Side metropolis in Mare Ingenii? Will your route bring you fortune and success, or will your competitors drive the development on the moon? Will you invest in better trains: Faster? Stronger? Or perhaps both? Based on the award-winning Empire Builder Game System, Lunar Rails uses erasable crayons to draw track between Lunar cities. The specially-coated gameboard lets you wipe it clean after each game, so every time you play the experience will be different! You get to decide on the best way to lay track to take advantage of the options before you! This is another in Mayfair's line of 'crayon' games. For those unfamiliar with these, the board starts out plain, with just the printed map of the area to be played in, such as England, America, Japan, or in this case, the Moon! Players use crayons to connect the towns together by drawing lines, or rails, between them. A deck of cards provides various demands, which is a product that a town wants. By connecting the product to the town, players then send their train along their track and when the goods arrive, income is earned. And thats basically it. 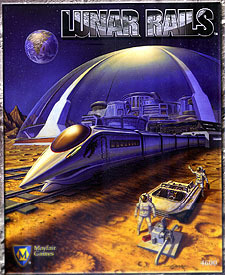 However, in Lunar Rails, mayfair have attempted to create the feel of playing on a sphere, and it works pretty well. The board depicts two circular areas, representing the near side and far side of the moon, with markers around the edges for connecting the two sides together. This isn't a game to learn to start playing 'crayon' games on, however, as it proves to be quite a challenging game, most of the board is mountainous, to start with! Not to mention crater rims and the threat of comets crashing down on the surface erasing track and creating more crater rims! If you enjoy this line of games, then this is a worthy addition to your collection, but it's definitely one for the more experienced player of this type of game. it isn't more difficult to play, just that you need to know what you are doing to win the game effectively.